Methyl Sulfonal Methane is a naturally occurring form of sulphur responsible for many essential metabolic processes and tissue repair. Add powder to water or fruit juice. Maintenance Use: half a shallow teaspoon (1g) daily. More may be taken if required during periods of extra need; up to 2 teaspoons (4g) daily. Its story begins in the oceans; inorganic sulphur in sea water is taken up by algae and converted to an organic form, (dimethyl sulphide). This evaporates and finds its way up to the ozone layer, where ultraviolet light from the sun converts it dimethyl sulfoxide and MSM. These sulphur compounds dissolve in atmospheric moisture and return to the land in rain. Plants rapidly and efficiently absorb MSM into their cell structure. It is from plants that we should obtain sufficient MSM for health. MSM evaporates easily, so is lost partly on storage of food and certainly on cooking. It is only by eating mainly a raw diet that we can obtain enough MSM. to meet our bodily requirements. So MSM is now recognised as a major deficiency, and since it is involved in so many bodily processes its deficiency is implicated in all health disorders to some extent. Low MSM content may result in adverse psychological and physical stress, tissue and organ malfunction, fatigue and increased susceptibility to disease. MSM has been found to provide substantial and often complete relief, to all common airborne allergens. Individuals with allergic asthma or hay fever report the same or fewer symptoms when reducing their medication to one quarter of previous levels, when taking MSM. Great news for asthma sufferers! Allergic reactions to foods are also considerably lessened by regular MSM consumption. Individuals with gastrointestinal symptoms such as diarrhoea, chronic constipation, nausea, hyperacidity, gastric pain and inflammation of mucous membrane often experience dramatic relief through regular consumption of half to one and a half grams MSM daily. MSM helps the body to rid itself from parasitic infestation in the gut. MSM enhances the general competence of the immune and detoxification systems by direct action; it is thought to compete for binding sites in the gut, the parasites cannot cling on, so are soon expelled. Particular parasites found to be eliminated are Giadia Lamblia, Trichonas Vaginalis, Nematodes, Enterobin. Sulphur is the main mineral responsible for oxygen uptake by cells (whereas iron is responsible for blood transport of oxygen), so adequate sulphur supports the beneficial effects of oxygen. This includes the diminution of yeast infections, such as candida albicans, improved resistance to, and elimination of harmful micro-organisms; and therefore a reduction or elimination of infectious episodes. 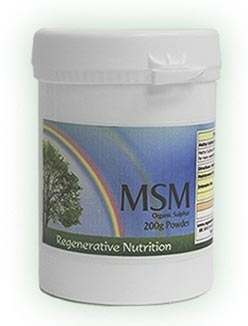 MSM has a leading role in helping to alleviate pain. Pain and inflammation is due to a number of causes - pressure imbalance in the tissues, toxins, and poor cell membrane permeability. MSM relieves all these causes. It adds flexibility and permeability to cell membranes, facilitating fluid and nutrient transport in and out of cells (and the release of trapped toxins). It also has the effect of softening tissue, helping to equalise pressure on cells. Many individuals with a variety of muscular skeletal disorders including arthritis report substantial and sustained relief of pain and inflammation while taking doses of MSM from 100 mg to 5gs daily. This is improved when vitamin C is added. It is sensible to take vitamin C in a balanced, natural way. Acerola Cherry is exceptionally rich in vitamin C with a complex mixture of bioflavanoids that work synergistically. The powerful antioxidant OPC contained in Vital Protect has a role in supporting collagen and other protein structures by maintaining healthy cross linking, and this is one reason, apart from its anti-inflammatory properties that OPC is helpful in the treatment of arthritis. Repair Tonic containing glucosamine is also of proven benefit in the treatment of arthritis, a combination of nutrients associated with rebuilding tissue, detoxifying the system and stopping inflammation, will yield a higher success rate and a more thorough treatment of arthritis than single nutrients alone. Glucosamine is the basic material for the protein structures of the eye and gluthathione promotes good eye health. The body produces both of these substances with the help of glutamine and sulphur. Applying a 15% solution of MSM to the eyes has been found to reverse cataracts. MSM helps the body deal with both physical and psychological stress. This is especially appropriate with psychosomatic disorders, e.g. digestive disturbance that is nerve or stress related. A group of 50 goldfish were separated into two tanks of 25 in each tank. One tank had MSM. added to the water. Both lots of gold fish were then stressed deliberately by varying temperature, and agitating the tanks, both in an identical manner. After 10 days 11 fish in the untreated tank had died, but only one in the tank with the added MSM. Persons taking MSM report increased alertness, concentration, more level moods and sometimes a relief of depression and anxiety, often within hours. Collagen is the most plentiful protein structures in the body and predominates in the formation of bones, skin, nails, hair, and many other body tissues. MSM and silica are two important nutrients that give collagen its strength and flexibility. Vital Protect helps in collagen stability. If there is insufficient MSM, as new cells are formed they become rigid and the skin lacks softness and flexibility. The tendency to cracking, and wrinkles will be greater when MSM supplies are inadequate. (Vitamin C is helpful to this process). It is far better to get the body to make its own collagen than to apply collagen to the skin, since it cannot repair cells this way. The fact that MSM gets right to the heart of the process of tissue/skin health and renewal can be seen in the rapid healing of wounds, disappearance of old scars, and even the healing of burn scars many years old (in this case MSM. was applied directly to the skin over a period of several months). MSM also helps the growth of healthy hair and nails. This is partly due to the substance keratin that forms a large part of the structure of hair and nails. Studies indicate that acne, including acne rosacea, respond well to MSM. supplementation. Skin disorders are often related as much to the health of the bowel as the health of the skin directly. Therapists report success in treating a variety of skin disorders with MSM and also glucosamine. MSM can often prove to be the miracle remedy in alleviating eczema. Take internally with vitamin C and apply some to the effected areas of skin once or twice daily either in solution in water or preferably mix in with some skin cream that preferably contains coconut oil. I forgot about MSM being so important! Having re-read the information and doing further research on the scope of MSM I now realize it’s the methyl group that is as important as the sulphur. I had plenty of sulphur in my diet, but was needed in the methyl form. After taking MSM I found it was possibly the only thing that could/did relieve the eczema that was attacking my feet and legs for months at a time over the past three years. Furthermore, an elderly friend of mine, with a serious skin condition, after only a few weeks of supplementing with MSM and Sodium Ascorbate and applying a solution of MSM to the damaged skin areas has already achieved approximately 80% remission. It should be noted that eczema, especially in the elderly, is very difficult to cure and eczema in general is of various and unknown causes. Those with low cortisol output from the adrenal glands may also need to take Adrenal MAX Support (bio-identical hydrocortisone (cortisol)) to achieve the best results. Emphysema is a particularly difficult condition to improve with any therapeutic modality. In one study subjects were given MSM; in four weeks all sufferers had at least doubled their walking distance.